Welcome to episode 10 of The CUInsight Experience podcast. Hosted by Randy Smith, co-founder and publisher of CUInsight.com. A few weeks ago, I was registering for this year’s CO-OP THINK conference (see below for a special discount code for listeners of the podcast), and was chatting about how amazing the event is and what a treat it would be to have a conversation with Samantha Paxson about her audacity to create this event over a decade ago. I immediately invited her onto the show, she accepted, and here we are! 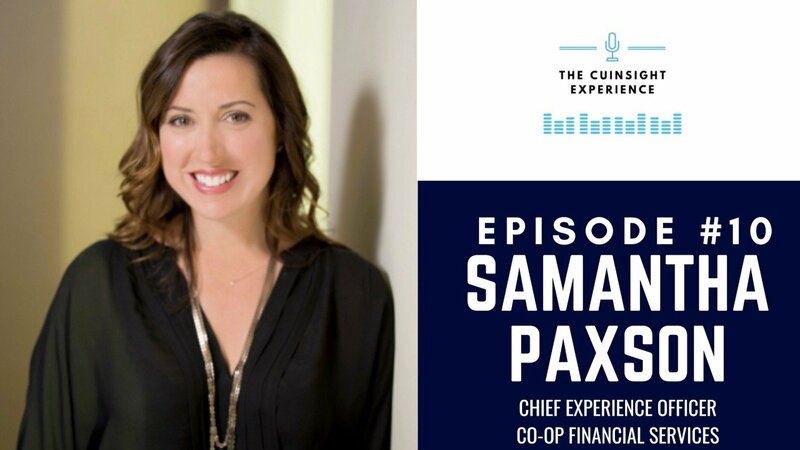 Sam is the Chief Experience Officer for CO-OP Financial Services and the founder of CO-OP Think. For the first ten years of her career, she worked in strategic and marketing consulting for sport, luxury, automotive, and hotel brands. These brands, she explains, were all about innovation and standing out. When she came to the credit union industry, she noticed how conservative and cautious it was in comparison. Sam wondered where leaders in the industry got new ideas and inspiration, and she started CO-OP Think to fill that need. If you’re not familiar with the conference, you might be amazed with the history of incredible guests, from Cory Booker to Gary Vaynerchuk to Michael Phelps. She looks for people who have had the audacity to have a crazy idea, go against the status quo, and make a huge difference. In our conversation today, she’ll chat today about how these guests’ expertise and experiences apply to the world of credit unions. We’ll also talk about the changes that Sam has seen in credit unions, as well as what she expects to see in the relatively near future. She’ll also talk about what she says so often that her team can finish her sentence, the greatest strength on her team, the evolution of her leadership style, and one of the most powerful life lessons she has learned. Don’t miss this episode that I hope will inspire you, too, to have the audacity to think big! 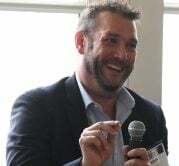 This is pretty cool: As a special thank you for listening to this podcast, CO-OP is pleased to offer 25% off of the registration rate for THINK 19. Join hundreds of credit unions in beautiful Miami Beach, Florida May 6-9 for the premier thought leadership event of our industry. Register here (use promo code: GRAND19). Shout-out to previous guests mentioned: Jill and Chuck. You can find all past episodes here. [00:03] – Randy welcomes listeners to the episode and introduces today’s guest, Samantha Paxson. [01:19] – We hear about some of the topics that Randy and Sam will chat about in today’s episode. [03:05] – What motivated Sam to imagine and start a completely different, new conference? [05:10] – Randy draws out and elaborates on a couple of the points that Sam has been talking about, specifically where she gets her insight. [06:30] – Sam talks more about where she came up with the audacity to bring in the amazing guests she’s had at the conference, and whether there was instant buy-in to her idea. [09:20] – Is there a person who Sam still can’t believe that she got to come speak? [12:55] – Sam has a whole list of people she would like to have at the conference in the future, she explains, and lists a few. [15:07] – Has there been a big change over the last 12 years of the conference? What can people look forward to this year? [19:28] – Sam chats about what she feels proud of after the THINK conference, and what she feels like she could have done better. [21:38] – Are there long-held beliefs about credit unions that Sam thinks will change in the next year or so? [24:30] – We learn about what it was about credit unions that inspired Sam to build a career at CO-OP. [26:16] – We hear about the biggest change in credit unions that Sam has seen over the past 14 years. [30:42] – Sam shares her thoughts on whether human integration has changed in the past decade because of technology. [32:53] – Does Sam think that her leadership style has grown in her over time, or was it always there and constant? [34:20] – Sam talks about the greatest strengths in her co-op team as a whole. [36:21] – Is there something that Sam has said to her team so many times that they can finish her sentence? [37:56] – We learn about some things that Sam isn’t good at. [39:18] – Sam shares a powerful life lesson that she finds herself referring back to over and over again. [41:07] – What does Sam do to break through the frustrating times when she runs into a wall? [42:49] – We learn about what Sam does to recharge, and what work/life balance looks like for her. [43:55] – We move onto the rapid-fire questions, starting with whether Sam has any daily routines without which her day feels off. [45:04] – When was the first time that Sam got into (memorable) trouble? [45:44] – What’s the best album of all time? [46:21] – Is there a book that Sam has given away or recommended a lot over the course of her life? [47:59] – As Sam has gotten older, what has become more important to her? Has anything gotten less important? [49:05] – When Sam hears the word “success,” who is the first person who comes to mind? [50:35] – Does Sam have any asks of listeners, or any final thoughts? [51:22] – What’s the best way for listeners to get in touch with Sam with any additional questions?